C21 Live Radio is a CDN service for publishing live progressive download audio content. Its high flexibility and availability ensures that the content reaches your audience from all over the world while keeping the highest quality. Progressive download broadcasting ensures the content playback on all devices with a single format. 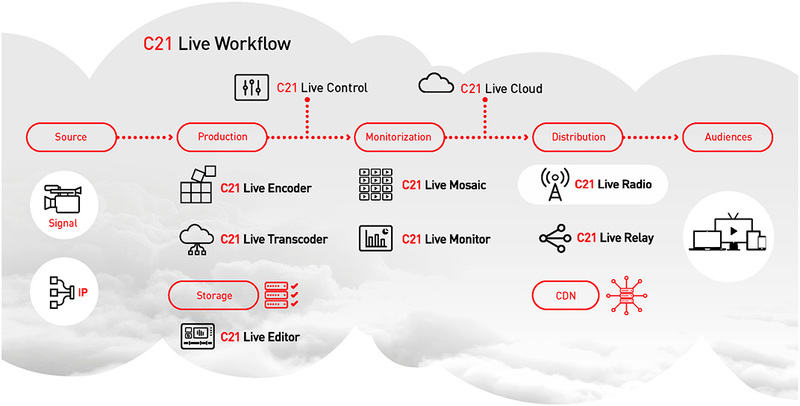 Moreover, Cires21 technology allows you to fully minimize the delay in the broadcast. Geolocation. To ensure the control over content rights. High Availability. Ensures high availability through the use of a level of redundancy adjusted to the needs of any customer. Auto scalable. Without restrictions on geographic regions and bandwidth. Historical and real-time statistics. By stream or stream groups. High flexiblility ingest. C21 Live Radio allows any protocol and format on the ingest side. Moreover, it also guarantees the security of the live streaming of our customers. Broadcasting close to the end user. The multihosted system allows to easily locate the content distribution resources nearest the audience, reducing latencies. Audience analysis through an advanced statistics. Full web interface where you can review all kinds of statistics on the use of your live streaming. Real-time data such as connected users, the bandwidth consumption, view historical data on the usage, advanced usage reports with information about the end-user location, number of users at peak, used besides average connection duration. A service based on cloud computing. Arquitecture: High availability, from ingest to broadcast.